On Wednesday(July 11th), Rita Ora hit the stage at the Henley Festival where she performed a medley of her hits & new songs at Henley-on-Thames in London. 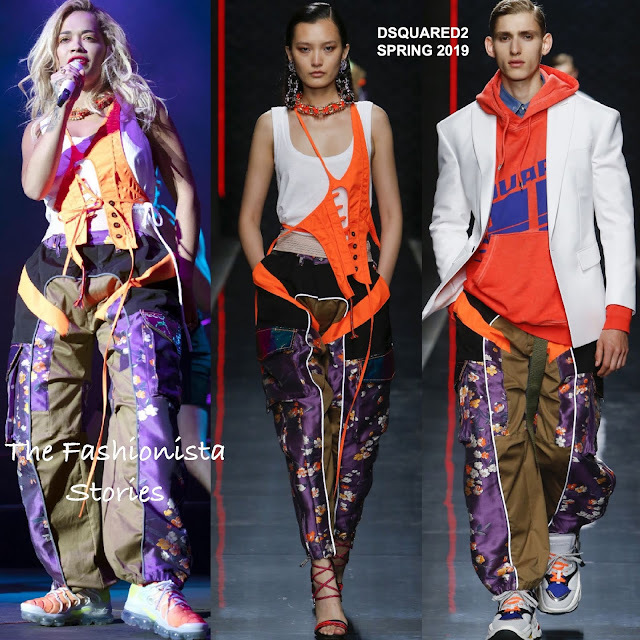 Taking a stroll in the 90's, she opted for a DSQUARED2 SPRING 2019 ensemble which featured a white tank which was layered with a reversed orange vest and floral & color-block panel nylon pants. While she could have worn heels for a chic, sporty finish, she opted for sneakers. Side parted curls and a colored lip completed the look. What do you think of Rita's performance look?